Sargent Shriver Peace Institute - Change "Comes From Us"
In our Quote of the Week, Sargent Shriver reminds us that we all have the ability to create positive change. In a short but powerful speech given at the University of Hartford, Sarge reminds us that "real personal and professional success is measured by whether you have improved your neighborhood, your town, your state, your country, and your fellow human beings." He emphasizes the importance of service as the way to effect change and to achieve true success. Sarge put his beliefs into practice throughout his career, as the architect of the Peace Corps and the programs of the War on Poverty (including Head Start, Community Action, VISTA, all of which continue to serve Americans today). His diplomatic efforts as the US Ambassador to France, his influence on the growth of Special Olympics, and his impact in the area of poverty law also demonstrate his ability to effect change, to serve, and to inspire others to do the same. 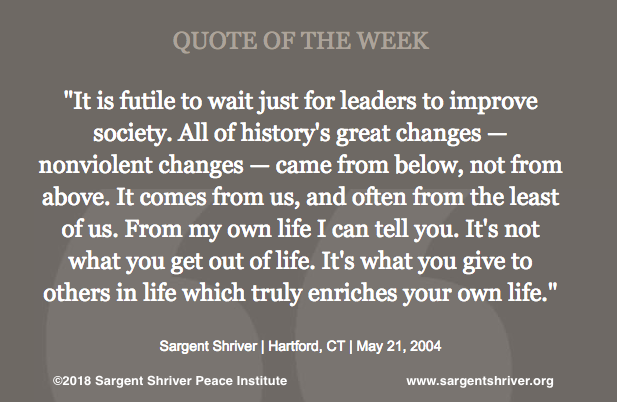 To learn more about Sargent Shriver's accomplishments, click here.